A seriously pampering shower experience that effectively nourishes skin. Dove has created a blend of rich cream infused with the perfect touch of caring oils and the delicate scent of jasmine and honey. Enriched with our breakthrough NutriumMoisture™, to nourish while you shower for longer lasting more beautiful skin. 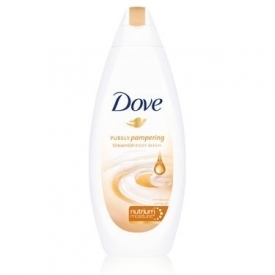 This one feels nice on the skin and definitely leaves your skin feeling smooth and soft. Like the Dove Silk Glow, it doesn’t foam but unlike that it it’s easier to use in the shower (that or I’m just getting better!). It has a sweet scent that lingers on the skin: not unpleasant at all but definitely there. Nice and easy to use but again not really a favourite.